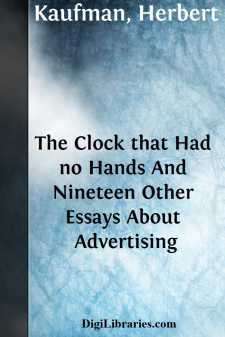 Newspaper advertising is to business, what hands are to a clock. It is a direct and certain means of letting the public know what you are doing. In these days of intense and vigilant commercial contest, a dealer who does not advertise is like a clock that has no hands. He has no way of recording his movements. He can no more expect a twentieth century success with nineteenth century methods, than he can wear the same sized shoes as a man, which fitted him in his boyhood. His father and mother were content with neighborhood shops and bobtail cars; nothing better could be had in their day. They were accustomed to seek the merchant instead of being sought by him. They dealt “around the corner” in one-story shops which depended upon the immediate friends of the dealer for support. So long as the city was made up of such neighborhood units, each with a full outfit of butchers, bakers, clothiers, jewelers, furniture dealers and shoemakers, it was possible for the proprietors of these little establishments to exist and make a profit. But as population increased, transit facilities spread, sections became specialized, block after block was entirely devoted to stores, and mile after mile became solely occupied by homes. The purchaser and the storekeeper grew farther and farther apart. It was necessary for the merchant to find a substitute for his direct personality, which no longer served to draw customers to his door. He had to have a bond between the commercial center and the home center. Rapid transit eliminated distance but advertising was necessary to inform people where he was located and what he had to sell. It was a natural outgrowth of changed conditions—the beginning of a new era in trade which no longer relied upon personal acquaintance for success. Something more wonderful than the fabled philosopher's stone came into being, and the beginnings of fortunes which would pass the hundred million mark and place tradesmen's daughters upon Oriental thrones grew from this new force. Within fifty years it has become as vital to industry as steam to commerce. Advertising is not a luxury nor a debatable policy. It has proven its case. Its record is traced in the skylines of cities where a hundred towering buildings stand as a lesson of reproach to the men who had the opportunity but not the foresight, and furnish a constant inspiration to the young merchant at the threshold of his career. Business is no longer a man to man contact, in which the seller and the buyer establish a personal bond, any more than battle is a hand-to-hand grapple wherein bone and muscle and sinew decide the outcome. Trade as well as war has changed aspect—both are now fought at long range. Just as a present day army of heroes would have no opportunity to display the individual valor of its members, just so a merchant who counts upon his direct acquaintanceship for success, is a relic of the past—a business dodo.